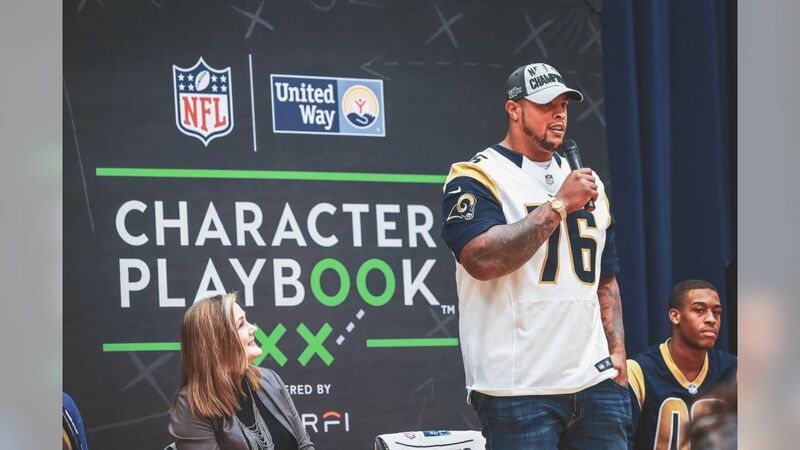 Check out photos of this week's Community Impact Player of the Week, Rodger Saffold, from his involvement with Character Playbook. “You can really feel the energy continue to grow every time we come out and visit kids in the community,” said Rams Guard Rodger Saffoldas he was preparing to lead a character-development session for students at Bethune Middle School in Inglewood. In partnership with United Way of Greater Los Angeles, Saffold and Rams cheerleaders hosted a Lunch & Learn session focused on the importance of character, healthy relationships, and making schools kinder spaces for all students. During the session, Saffold discussed a variety of life-scenarios, shared ideas about the definition of good character, and answered questions for students. When the participants split into groups, he visited tables to facilitate the discussions and participate in each of the group activities. Saffold also encouraged all groups to share their answers with the entire assembly as a way to create a collaborative learning process that invited everyone to partake in the discussion. 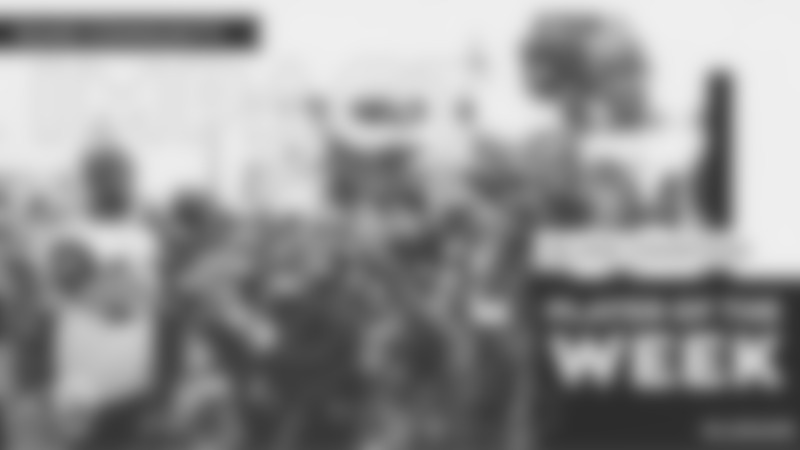 The event was part of Character PlaybookTM, an innovative digital course that uses evidence-based strategies to educate students on how to cultivate and maintain positive relationships during their critical middle school years. In the program’s first two years, Character Playbook has helped nearly 5,000 students in over 40 schools in Los Angeles learn how to cultivate and maintain healthy relationships. Sharing the Rams’ commitment to inspire the next generation of high-character individuals is United Way President and CEO Elise Buik, who attended the character-development session and has dedicated herself to improving the quality of life for Angelinos by working to address the community’s social and economic challenges. "We are so fortunate to be a part of another great initiative with the Los Angeles Rams and our schools with the Character Playbook. We are proud to recognize the Rams' Community Player of the Week, Rodger Saffold, through his support of youth mentoring programs and his commitment to shaping our young leaders for tomorrow," said Buik. "Attending the Character Playbook this past week with Rodger and others from the Rams team, I continue to be in awe of their openness and willingness to engage and learn about our communities and how to set examples for our youth. For me, character is what allows you to do anything you want to in life, and Rodger and the Rams are examples of achieving just that." Additionally, Saffold has been an active supporter of Big Brothers Big Sisters, an organization which provides children facing adversity with strong and enduring, professionally supported one-t-one relationships that change their lives for the better. For the past three seasons, he has purchased 50 tickets for each Rams home game to provide NFL game experiences to “bigs” and their “littles” as well as children who are waiting to be matched with an adult-mentor.